Well there was no holding us back last week! The chapel was filled with the joy of the Lord as we gave Him PRAISE for who He is and our relationship with Him! We continue this Wednesday with our 40 Days of Praise Campaign. This week we will dive into our understanding and expression of worship as we join together for a time of singing, group discussion and listening prayer! 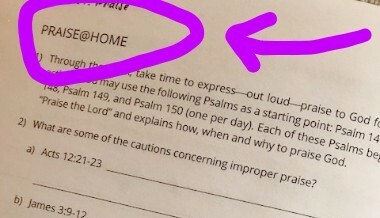 Don’t forget that every session has a PRAISE@HOME section at the end of the small group questions. Lesson 1 can be found on pages 8-10 of your study guide! Click the above link and enjoy some @HOME praise while you listen to this song!